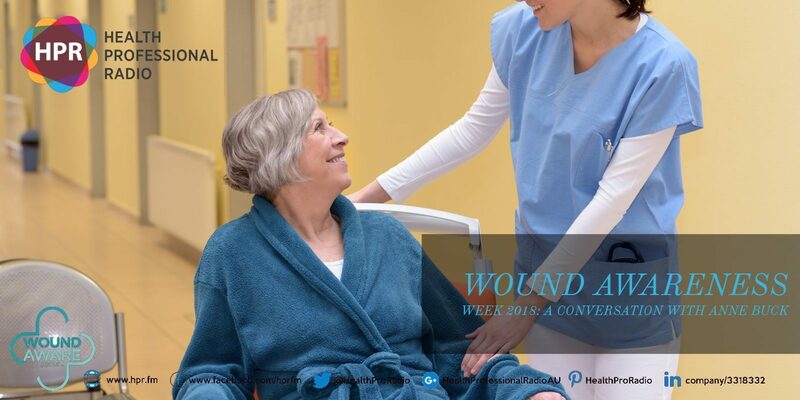 Wounds Australia’s CEO Anne Buck returns to HPR to promote Wound Awareness Week 2018 and the comprehensive 5-Point Plan that her organization created that can help in reducing the burden of chronic wounds. Tabetha Moreto: Hello everyone, welcome to Health Professional Radio. I’m your host for today Tabetha Moreto. Our guest today is Anne Buck, CEO of Wounds Australia. She’s here today to talk about Wound Awareness Week 2018 that highlights Australia’s hidden affliction of chronic wounds as the number of sufferer soars. Without further ado, welcome to the show Anne, it’s so nice to have you here again. Anne Buck: Hi Tabetha, thank you for having me on Health Professional Radio. T: Yes, it’s always my pleasure. So Anne, please tell the audience especially those who are not able to tune in to your first interview, please tell the audience something about yourself. A: So I am the CEO of Wounds Australia and Wounds Australia is an organization that represents health professional to have an interest or a specialization in wound care. We run our Wound Awareness Week every year as part of our mission to improve wound care in Australia. And this year, we are very much focusing on encouraging health professionals to have conversations with their patients about chronic wounds because we see that’s a good way to overcome the barriers to community awareness and community recognition of chronic wounds as a very significant health issue. T: That’s wonderful. I remember Anne last year, I interviewed you regarding Wound Awareness Week 2017. So now, tell us what is the focus of Wound Awareness Week 2018? A: So in 2018 we’re continuing some of the materials that we released in 2017, but this time, we’re making it bigger and better. So this year, we’ve actually released a patient brochure that health professionals can use and provide to their patients and we’ve developed some animated videos around common chronic wounds that we released into our social media platforms under our website and they are also intended for the consumer audience so that people who are not familiar with what it means to have a chronic wound and for example, how quickly a diabetic foot ulcer can develop or the importance of seeking compression therapy for a venous leg ulcer so people and consumers can actually access that information and those messages in a really accessible way. So we’ve definitely produced and developed more material around helping our health professionals talk to consumers and support consumers. The other thing that we’re doing is part of Wound Awareness Week this year, which is very important, is we’re also targeting our politicians. So during Wound Awareness Week, we’ve released our “Five Point Plan” to reduce the burden of chronic disease and then, we’re taking that plan to the politicians in Canberra and we’re talking to them about what we think the government needs to do and the funding that’s needed in the health system so that we can actually help people get access to wound care in a more cost-effective and timely fashion. T: Wow, that’s wonderful to know that your organization is really working hard in order to promote wound awareness and how can people get the best care. A: Thank You Tabetha. Yes, we are. We work very hard and wish our health professionals and we also are beginning to get more effective at communicating our message to the general public and to politicians. I’d like to go into a bit more detail about our five point plan if that’s okay with you? T: Go ahead, tell us all about it. A: So our five point plan is based on the work and the information and the consultations that we’ve had with members over many years. But the first thing that we’re calling for is we’re calling on the government to put more Medicare funding into the treatment of chronic wounds in primary healthcare, so we know that the many people going to the GP is the first step when they have a wound that isn’t healing. But despite that, it is not particularly well-funded in primary care and so people may not be able to afford to get the regular care through their practice nurse or through an allied health professional in primary care. We also have done some research that suggests that in areas like venous leg ulcer treatment, if you were to fund compression therapy for people with the venous leg ulcer and do that through primary care, then we could save the health system around $166 million annually. So for that reason, we’ve used a very cost-effective way to provide funding for chronic wounds. Equally though, as well as the treatment that people get from the health professional, it’s also important that they’re able to access the buy it sources, wound products and dressings and that’s something that for many years, your listeners would know and our members know is a real barrier for people to be able to get their chronic wounds treated and healed. So we’re actually asking the government to commit to a subsidization scheme of some sorts for wound products. And we’ve said that, particularly for the people who are at risk of venous leg ulcers, diabetic foot ulcers and for people aged over 65. So we know that those products can be expensive but we also know that if people get access to the right products or the buy it for their wound, then those wounds can heal more quickly and actually that saves money for the health system in the long run. There’s a couple of other areas in our five point plan obviously that’s number one and number two. The third thing that we’re asking the government to do in our five point plan is to work with us to raise awareness of chronic wounds. So we think that the chronic wounds are significant in our health issue that the government should be supporting a public health campaign. So chronic wounds, we know, cost the health system around $3 billion annually, plus they are almost out-of-pocket costs that consumers themselves have to carry. So with such a significant cost to the health system, we think it’s very important that the government actually commit to improving awareness and information in the public domain so that people who have a chronic wound are getting access to care and they know where to get access to care, they know what warning signs to look for, they know what questions to ask their GP and in that way, we can actually improve the speed at which people get access to treatments and we stop seeing so much of what we know happens out there, which is that people just suffer in silence with their wounds that isn’t healing. So the fourth prong of our five point plan is to call for some funding for those frontline health professionals. So as your listeners would know, for the nurses and the aged care staff to working with people in residential aged care facilities or in community settings actually, they’re the ones who are doing a lot of the work with wound care. So we’re calling for the government to put some money into funding and funding for training for those health professionals and other workers and particularly, we want that to be accessible to the workforces in rural and remote areas. We know that those workforces desperately need training and support in wound care so that the patients and the people that they look after has better wound care available to them. T: That’s wonderful to know that your organization has developed this five point plan and hopefully, the government will do something about it especially in terms of increasing their funding and also increasing awareness for this. A: Yes, absolutely. We think that we will be taking this five point plan and having discussions with representatives of the major political parties over the coming months. And in our political cycle, we’ll be going to a ethical government election at some point in the near future. So we’re hoping that the major political parties will make a commitment to this plan as part of their election platforms. T: Absolutely. So let’s hope that the government will listen to your platform. T: Fantastic. Anne, I would love to chat with you more but we’re running out of time but before we go Anne, for those who want to participate in Wound Awareness Week 2018, how can they do that? A: People can participate in Wound Awareness Week 2018 by going to our website which is www.woundaware.com.au and downloading the resources and the materials available there and using them with their patients if you download the patient information brochure and there are also some information sheets around different types of wounds. You may also want to share some of our material through social media and help us spread the word and start those conversations about chronic wounds. So this year, if you search for the #letstalkaboutwounds, you’ll be able to find access to our social media and help us spread the message through those platforms. T: That’s fantastic. Thank you so much Anne for coming back on the show. It’s always a pleasure having you. A: It was lovely to talk to you today Tabetha and I hope that your listeners will get behind Wound Awareness Week and talk about wounds with their patients and amongst their colleagues. T: And that was Anne Buck, CEO of Wounds Australia. If you liked this interview, transcripts and archives are available at www.hpr.fm. We’re on all social media platforms so don’t forget to follow, like and subscribe. Show us some love by subscribing to our HPR YouTube channel. We’re also available for download on Soundcloud and iTunes. I’m Tabetha Moreto and you’re listening to Health Professional Radio.